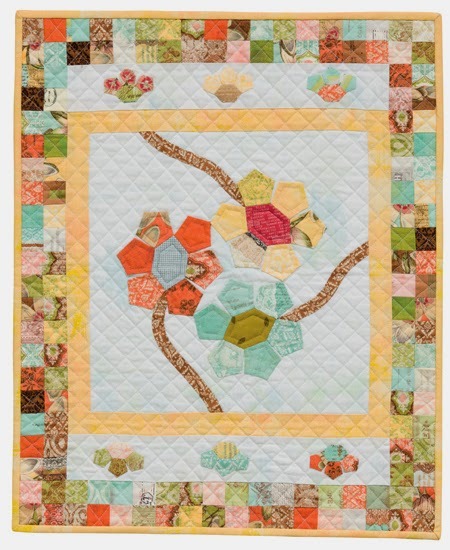 Spun Sugar Quilts: Fun Size Quilts and a Giveaway!! Fun Size Quilts and a Giveaway!! and can be made with fat quarters too! My Fun Sized quilt is called Particularly Joyful. I let Curio 'age' on my stash self for a couple of years before I made this quilt. There was one other quilt in the book that caught my eye immediately. To Do List, and it's on my to do list for my sewing area. I'll choose a winner on July 30th. If you want 15 more chances to win, stop by Martingale's Blog to see the list of contributing authors and how to enter their giveaway. I have not done any minis but this book might just inspire me to do a few - they look so sweet! thanks! I love sewing anything...something about whizzing along on my machine is soothing to me. Plus, who doesn't need pretty fabric in their lives? I particularly love planning the quilt and picking out the fabrics. Thanks! Since I discovered Susie's Magic Binding, that is my favorite part of making quilts! My favorite part is making the quilt and seeing it come together. seeing a quilt top come together makes me joyful! When the quilt is handed over to someone who will enjoy it. Thanks for the chance. The part of quilting that I enjoy the most is at the end, when the binding is on and I'm clipping any hanging threads. I get such a feeling of satisfaction in knowing that I accomplished my goal. Looking at the final project. It's all about the process - enjoying each step of the way. And anticipating how much the recipient with love the finished quilt! Since I'm a hunter/gatherer by nature, I really enjoy finding the perfect fabrics for whatever I'm going to make. Color is what makes me particularly joyful, no matter if I'm sewing or picking out fabric. My favorite part is putting together the fabrics for a project. I get to play with my stash! I love hand stitching the binding on quilts ! I love picking out a pattern and fabric when I make presents. I like how I have to think about what the recipient would like, rather than my own tastes. It forces me to look at things in a different way. Just getting to handle and play with all the lovely fabrics. Looking at beautiful fabric makes me joyful. It can also soothe the soul, put pep in my step, and relive memories of wonderful shopping excursions with friends. I love to sew fast and piece. It brings me joy. Just looooove hexies... can't stop making then. They are all over the place. In the car, at the office, in my handbag, in my sewing area, and even some sitting in the bottom of a cupboard waiting to become a waistcoat! 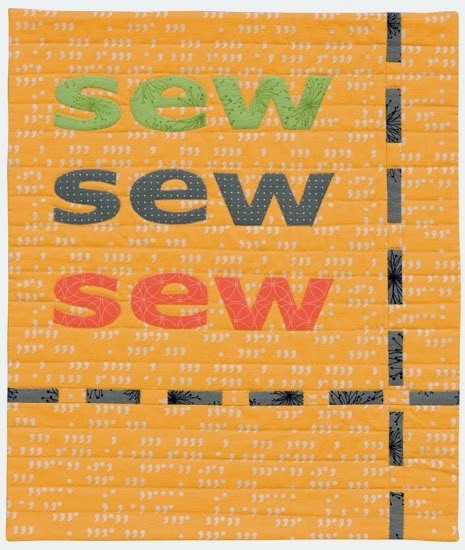 Every part of quilting or sewing is joyful except cutting out pattern pieces for sewing clothes. I like creating a quilt out of my stash. It all makes me joyful but I especially love giving quilts, bags, etc. as gifts. What I love most about quilting is that there are so many different stages of each quilt. No one part takes so long that I get tired of it so it's always fun to look forward to the next part. So I guess it is the variety of tasks that gives me joy! I love your little quilt! I like to make mini quilts as they usually finish up quickly. I also like hand sewing, but I enjoy the entire process of making a quilt, except maybe putting on the binding. I haven't made any minis, except for some mug-sized place mats - but these would make great gifts. What makes me joyful about quilting is the fabric and the color. I can envision how it is going to look even when others can't. My husband is in awe of how I can see the colors coming together before anyone else. I think I would love a job just putting quilt kits together! finishing it is my favorite part! I think my favorite part of any project is picking out and petting the fabric. It can be stressful because I can be somewhat indecisive, but I really love it too. I enjoy every part of making a quilt. I find it particularly joyful to see others' reactions to my quilts, especially when it was lovingly made as a gift for them! I love searching for just the right fabric, but my favorite part is the look on the face of the person I give it to! I love both piecing and machine quilting. My favorite part is the quilting!!! Love standing there, creating beauty upon beauty with thread! I love choosing fabrics, whether that means mixing and matching from my stash or in a store, or just buying pre-cuts. I especially love it for babies. I also enjoy the laying out of projects! I love the entire process of cutting up fabric and putting it back together into something useful! I like creating a scrappy quilt completely from my stash without having to go shopping for new fabric. Just love your quilts and love the mini Particularly Joyful. Finishing something and giving it away makes me joyful. But I also like to look at the different fabrics and decide what goes the best together. Just looking at some cheerful fabric can make me happy! I enjoy seeing my design emerge and come to life when making an art quilt. I start with a vision of what I want it to look like, then when it actually emerges from the background, it's such a joy to see the completed picture. I love the piecing part of the quilt journey the most. I love seeing the design emerge as the blocks are finished. HI,I do love the planning of the quilt;but love the piecing+final binding too! Thanks for sharing! I love working with any kind of needle and thread from sewing to needlepoint to embroidery. It helps to calm me, inspire me and an outlet for any kind of artistic ability I may have in my little pinky. Thanks. Choosing the fabric & placement of the colors w/in the pattern for myself & friends on retreats! I love using the creative side of my brain after a long day of critical / science thinking from working in a research lab! Congratulations, Vikki, your little quilt is lovely. All aspects of quilting bring me joy especially when they are going to be gifted. It may sound strange, but I always look forward to having a pile of HSTs or flying geese that need to be trimmed to size. It's a bit of a Zen thing for me. I am always happiest when petting...ohhh I mean picking out fabrics. My favorite part is picking out the fabric to use in my quilt. II think a great quilt starts at the fabric choices. I think the planning is the joyful part of my sewing and quilting. Unfortunately I don't always carry through, but I'm trying to change that. I love to hand sew binding on quilts, and to do hand quilting. Both are extremely relaxing! Thanks! Please click on the delaineelliott above for my email link. The minis are so cute! Tanks a bunch for the chance to win this book! All of it... except ripping. I love hand quilting and hand sewing but I also love machine piecing and machine sewing anything - oh except curtains!!!! I like the planning and shopping, and finishing up the binding, and I'm very fond of hand work. I like everything about quilt making! It helps me refuel! I enjoy piecing a quilt because I can see my ideas really coming together. I like the research process to get the creative ideas for the next quilt. getting out an collecting concepts from Art, nature, and what other quilters have done. I also like the physical construction process the precision and discipline. Sewing in my own sewing room in front of the window while putting my favorite colors and fabrics together makes me so happy! That's the best part, when I create something new and pleasing to my eye. Choosing color combinations and piecing the quilt are my favorite parts of making a quilt. I love to choose the fabrics! I enjoy the quilting part the most. My favourite part is making the quilt and seeing how it all comes together. I like the start of a new quilt project. I like deciding on the design or pattern, picking the perfect fabrics and getting started to make my vision come to life. So far my favorite part of making quilts is whatever part I'm working on at the moment. I also really like browsing in my Fabric Petting Zoo--I won't live long enough to use it all, so it must be meant for gazing and petting! Joyful! It has to be hand sewing each and every binding on a finished quilt! Love, love, love! I love when I sew for my kids and they get excited about what I made for them. The part of quilting that makes me joyful is choosing just the right fabric combination and it turns into something awesome! That and when all the corner seams match!! thanks for the give away! I like buying fabrics. I love creating. I feel terrific when I finish a projects. I have to say that all parts of quilting make me joyful. Each part of the process is a step to the finish. A medley of coordinating fat quarters always gives me possibilities! Finishing and pulling a done, warm quilt out of the dryer. It's always so fluffy! I love the point when everything else for the project is done and I can just sit at my machine and sew.! I really like the cutting process of quilting. Thanks for the giveaway. I love it all, no matter what part of the process I'm doing. I'm frustrated a bit while trying to pull fabrics together when I need more than 2-3 different fabrics. I stress too much about messing it up and then end up hating what I've spent my time creating. So far I haven't had that happen so I shouldn't be so hard on myself. I just need to have more practice and then that will be easier for me too. Love the process--especially hand sewing the binding on and knowing it's done! Thanks for the giveaway! I LOVE the "creating something from nothing" feeling. That moment when you hold up a finished quilt top, and then a finished quilt and say..."Yeah. I made that. I'm awesome!" I love the look on the recipients face when they get the finished product. I am happiest when I have finished a stack of small charity quilts and deliver them to pediatric chemo unit. It gives such a sense of purpose to my hobby. My second happiest moment is buying the fabric. I love quilting - many hand quilted but am now working on machine quilting. I love taking that first line of stitching out from under the pressure foot--I'm on my way! I love choose a pattern for a special person, and then choose fabric thinking in their preferences. 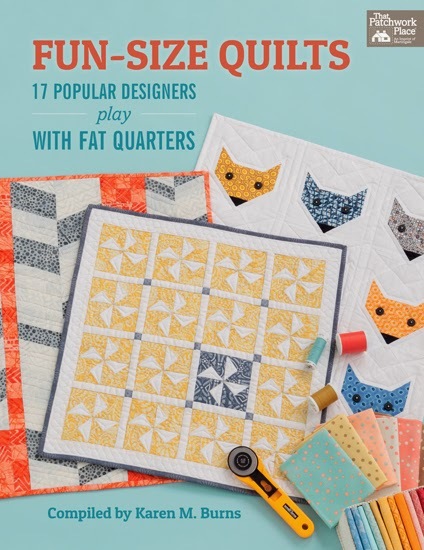 I've create a few mini quilts and this book has lots of great ideas! I love mini's because they allow me to use fabrics from my stash! I like to see all the hard work pay off once the project is done. I especially enjoy binding the quilt by hand because I know it is almost ready to give to some one special to me. I love to sew clothing and mini quilts totes purses and I love it even more if it all comes together as planned and i finish it I have a pile of UFOS! I like the quiet. I barricade myself in the basement and just get lost in creativity. I like the whole creative process of taking raw materials (thread, fabric, sewing machine) and creating something amazing from them. I like the binding. Quiet time near family. Quilt nearly done and time to think of the next project. I like binding - because then I'm done and ready to move on to the next quilt. I love every aspect of making a quilt... it is my therapy. some days I love the piecing, and I always have at least one hand-sewing project going. I have never done mini's before but sewing is very soothing and calming for me. Makes me relax after a long day at work! I love the excitement that comes with a finished quilt and especially when it is a gift for someone special - in fact only special people get my quilts because I know they will be cherished and loved. I love paper piecing. I use Peggy Martin's Quick-Strip method, and it makes it fun, rhythmic, assembly-line. I get in a groove and can't stop. then I love trimming the sections and fitting them together--stars are perfect and points are wonderful! I love touching, and rearranging, fabric! I really enjoy hand quilting at my quilts. I find it relaxing and a great way to just slow down. Lately, I have really enjoyed hand stitching, or embroidery. I think it's calming, I like to sit and enjoy my family while still creating and keeping my hands busy at work. Hand stitching anything. I love my machine, but there is something soothing about sewing something by hand. Fabrics bring sunshine to me! Love 'petting' them and getting inspired to make something. Visit Vickie's profile on Pinterest. April "Making it Fun" Blog hop by our Michael Miller Fabrics Brand Ambassadors! 249 … Welcome Scallop Lovers!